Al-Masjid al-Harām in Makkah. 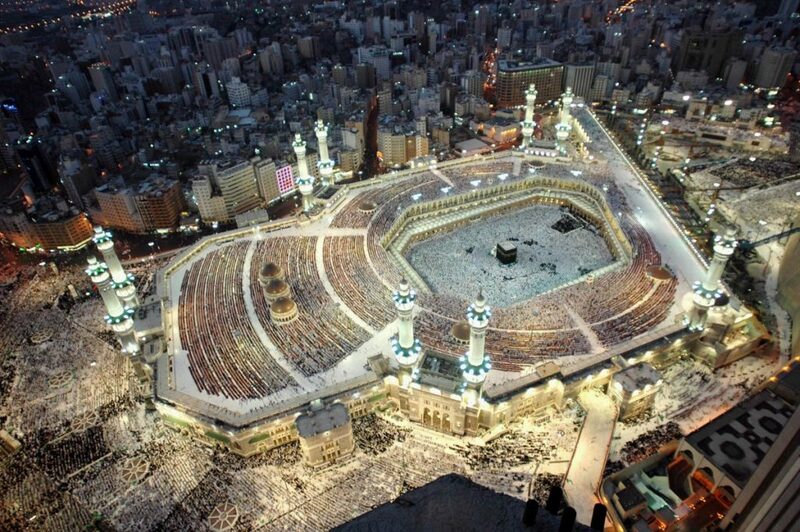 The largest Mosque in the world. Built as place of worship by the Prophet Abraham and his son Ishmael. Millions of people pray there each year. Objectives: To consider the importance of the Mosque within Islam. Is a Mosque important: Try to imagine what a Muslim community would lose if it did not have a Mosque. 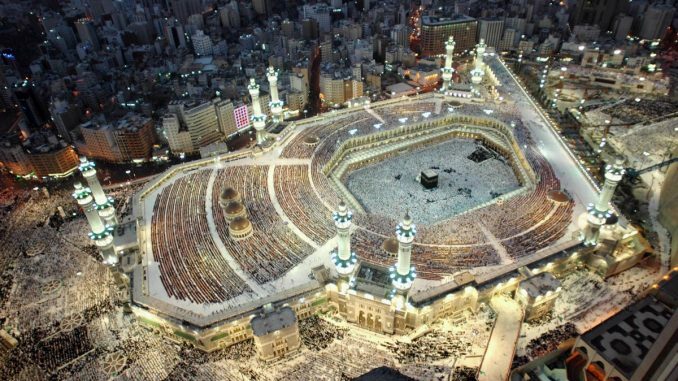 It would have no place where the whole community could pray collectively – a Muslim is expected to pray five times a day and to abandon the prayer is not an option for any Muslim, since it is the greatest obligation after Tawheed (the affirmation of the worship of Allāh alone). Think again from previous lessons, the extremely important role that the Mosque plays in the lives of Muslims. All this shows that it is very important for a Muslim community to have a Mosque. A truly Islamic mosque must be based upon the Sunnah of the Prophet (ﷺ), free from innovations and misguided ideas. Mosques are places for the worship of Allah alone, free from idolatrous practices, since Islam is a purely monotheistic religion. Mosques can attract non-Muslims to Islam by showing them some of the religious activities of the Muslims such as the prayer, making them curious about Islam and its beliefs, and giving them an opportunity to find out more. Mosques are centres of learning and study of the Qur’an, hadeeth, Sunnah, Seerah (the Prophet’s life) and more. Mosques are a meeting place for the community where they are informed of important religious events and duties. Allah’s Messenger (ﷺ) informed the men that they are not allowed to prevent women from attending the Mosques, because Mosques are important places for them too. Some Mosques are negligent and do not follow the Sunnah, nor do they give importance to Tawheed. A very small number of Mosques open their doors to radical ideas – good Muslims who want to follow the Sunnah should be not deceived by these type of Mosques or the people who speak there. The Friday prayers are obligatory upon every adult male, and these are conducted in the larger Mosques. How much should a Muslim community spend upon building a mosque? What facilities should it include? How decorative should it be? Should it have a minaret or a dome? The early mosques were modelled on the Prophet’s (ﷺ) Mosque in Madinah. This was a simple courtyard alongside his house which provided some shade for people at prayer and was also used a meeting place. Three simple wooden steps were used as a Mimbar (Pulpit) so that everyone could see the Prophet Muhammad (ﷺ) when he delivered a sermon, and the call to prayer was given from outside the Mosque on a roof. Today, in contrast, many mosques are magnificent structures, expensive buildings intended to show the show the greatness of Allah. Islam teaches that people should not waste resources Allah has given them. So, the question is: should huge amounts of unnecessary wealth be spent upon a building with minarets and domes and extravagant chandeliers, etc. when a simple, clean and handsome purpose-built structure would be sufficient – so that surplus wealth could be given to needy Muslims or spent elsewhere in the Mosque facilities (e.g. a funeral facility, a mosque bus, a library facility, etc.? Some Mosques are more important than others. The Grand Mosque (Al-Masjid Al-Harām) in Makkah is a universal and international symbol of Islam and focus of every prayer – it is the place of Umrah and Hajj. It is necessary for it to be huge, strong and handsome due to the millions that pass through it weekly. The Prophet’s Mosque in Madinah is also important. Many Muslims see the larger British mosques as centres of the Muslim community and as a visual reminder of their duty to Allah. Muslims must place a great emphasis on encouraging Mosques to operate and conduct themselves upon the way of the Sunnah of the Prophet, and upon the path of his Disciples, who are an example for all Muslims. Some Muslims do not go to the Mosques very often; some don’t go at all! They use their homes, work or schools as places of prayer. They keep in touch with others by phone, text, or email. They learn Islam by books and the internet. This is not good for the development of Muslims because they may become targets of cult groups and sects that may lead them astray. Furthermore, it opposes the clear religious textual command to attend the Mosque for prayers. It is possible to worship five times and day and establish the rest of the Pillars even if there is not a Mosque nearby, but that is not the ideal for any Muslim. A Muslim always desires to worship alongside other Muslims – that unity and sense of brotherhood strengthens further the faith of Muslims, and keeps them connected. Write a page on the importance of Mosques in the lives of Muslims. Design a Mosque with all its facilities. Then draw it.